WHY subscribe to THIS craft show list? Because THIS is the one you need to give you the details of the events - to give you a BETTER CHANCE of choosing the RIGHT shows! Not an artist or crafter? We publish events that cater to most vendors as well. Whether your an artist, crafter, entertainer, food concessionaire, reseller or corporate booth, there are events published in our Guide for you: Art & Craft Shows, Street Fairs, Festivals, County & State Fairs, Home & Garden Shows, Farmer's Markets, Antique & Collectible Shows, Car Shows, Holiday Gift Fairs, and more. Maybe you're tired of hangin' out at the WRONG shows . . . it's time you had a GREAT information resource that gives you the details you need: eligibility requirements, the size of the show, whether it's indoors, outdoors, or in a tent. We tell you how many years the event has been going on, - attendance, space sizes, and what ELSE is happening that may affect your sales! 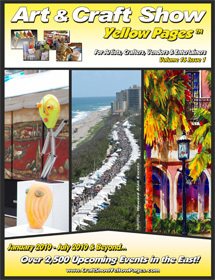 Use the detailed information in Art & Craft Show Yellow Pages to select your events carefully! Subscribe Now to have Instant Access to events in the Northeast, Mid-Atlantic & Southeast region's. We Update our Online System of events Daily! And we do so with price as we verify all events for accuracy. We have been in business for over 30yrs, so you can count on us to deliver what we promise and what NO other service can. SAVE TIME AND MONEY! WE do the research so YOU don't have to! SUBSCRIBE NOW! Art & Craft Show Yellow Pages is GUARANTEED to help you in your business, or we'll refund your money. We're confident our guide will help you find profitable events for your business. Event details makes it easier for you to choose the right shows for your product line. O.K. - Just imagine the impact on your sales if you arrive at a show to find they have free donkey rides and 10-cent hot dogs, - or an Antique Auto Show. It's great news if you carve exotic-wood replicas of antique cars, because your customer is waiting for you. Wouldn't you travel another 50 miles, or pay another $50 for the opportunity if that were the case? On the other hand, if you make large stoneware salad bowls, your customer won't want to carry these heavy packages around while the kiddies take another donkey ride... There may be better events for you elsewhere that weekend! 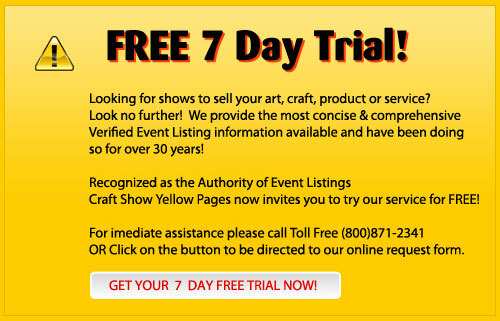 USE ART & CRAFT SHOW YELLOW PAGES FOR A BETTER CHANCE OF PICKING THE RIGHT EVENTS AT WHICH TO SELL YOUR PRODUCT! With this directory, you'll just use a yellow highlighter to mark all the shows you MIGHT be interested in, - then go back and fine-tune your choices for the best selections to sell your particular products! What sells well at this type of show? Inexpensive impulse items: toys under $15, string-a-name jewelry, personalized leather bracelets, T-shirts, food, candy, etc. If you have a wide range of products, load up on your low-end pieces, -but remember to take a few larger expensive items as 'show stoppers.' Someone may buy the big, beautiful pieces, but their real job is to make customers stop and look at your display. Usually they buy something less expensive, but in their minds, they're buying some of the MAGIC of your very special piece. Art & Craft Show Yellow Pages is GUARANTEED to help you in your business, - or we'll refund the cost of your subscription. SAVE TIME AND MONEY, we do the research so you don't have to! We absolutely guarantee Art & Craft Show Yellow Pages will help you in your business, or we'll refund the cost of your subscription, no questions asked! THIS is the one show guide that profiles the events so you can make intelligent choices! Dates, application deadlines, public admission fees, the total number of spaces, show hours, setup times, complete contact information, -more. If the show is outside or in a mall, -it's right in the description column. Outside shows are demanding. Fragile products can be ruined in a sudden downpour. Art & Craft Show Yellow Pages saves you time and money because you don't have to make long distance phone calls just to find out if the show is outdoors...just read the detailed descriptions and prepare your setup to deal with the elements. Eligibility requirements: Is the show open or juried? Do they want slides or photos? Is it a THEME show? Will they refuse certain items, e.g. strung beads, floral arrangements, ceramics from commercial molds, prints, photography, etc. Is it an art show? Will they accept crafts? Do they accept imports and manufactured items? Do they accept food vendors? Is it predominantly traditional or contemporary? Is it a wholesale or trade show? WE PUBLISH THESE DETAILS FOR YOU! Amenities: security, electricity, food, printed programs, tables, chairs, space sizes -more. Miscellaneous fees: for corner spaces, electric, jury fees, commissions, etc. Show history: how many years this show has been running. Last year's attendance, local sales tax, -more. Most important: we publish what else is going on, on-site, that may have an impact on sales, such as a parade, pony rides, or an Antique Auto Show. These details, and the way we set the information in easy-on-the-eyes columns, make it easier for you to compare shows. That's why we put all this information in our show directory. We spend hundreds of hours on this type of research, so you won't have to! You have more important things to do,- right?